Mummy went shopping today. Usually when she goes shopping she brings me home a present and most the the time that present involves chocolate. I really really love chocolate. So myself and Ted were waiting at the front window for her today 🙂 She put down the shopping bag in the hallway and wandered off. She obviously forgot to give me my present! She’s so old she’s losing her memory. So I decided to go through the bags to find my present myself. There was no chocolate. None. Not even a crumb! What I did find was a pig. It had ‘door stop’ written on it’s ear, very strange. I decided to bring the pig into the sitting room and make it comfortable. Mainly because it might know where the chocolate is hidden. I even got a scissors and took the tag out of it’s ear because it looked sore. I’ve spent the last hour trying to talk to the pig. He hasn’t said a word! He’s obviously very good at keeping secrets but I’ll wear him down. Ted keeps making sighing noises and shaking his head at me, I don’t know why. 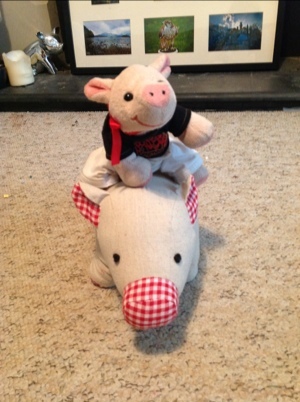 This is one very crafty pig… I even tried sitting on him to try to get a reaction but he didn’t even move. And he beat me at a staring competition, that’s not allowed. I want to ask my Mummy about him to find out if he’s staying long. But then I’d have to admit that I was rooting about in her bags again and she doesn’t like it when I do that. My current plan is to wait a few minutes and then start shouting that one of her bags is moving and a pig has climbed out and run into the sitting room. 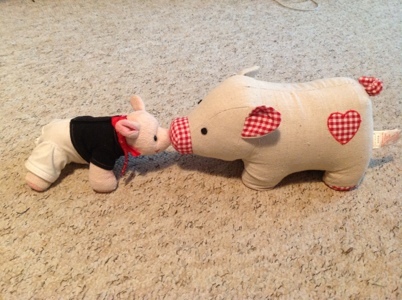 This entry was posted in Uncategorized and tagged Pig door stop. Bookmark the permalink.